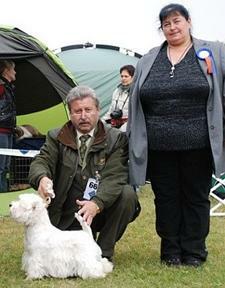 Big success got representant of our kennel Ilém zo Zlatej Záhrady, owner Mrs. Sofie Toender from Denmark. 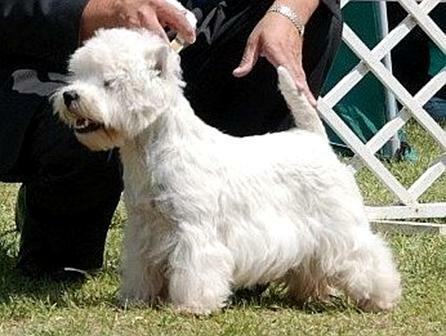 He got evaluation BOB at Interra Show and Nordic Winner Show and fulfilled conditions for getting the titles Nordic Winner 2008 and Nordic Junior Winner 2008, finaly Westie of the Year 2008. 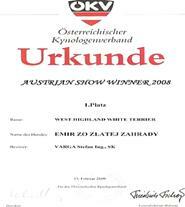 Thanks to the great success during the show season 2008 got our Emir zo Zlatej Záhrady eveluation 1st place Austrian Show Winner 2008. We believe, that Emir and also our other representants will be so successfull in the outcoming show season 2009 too. 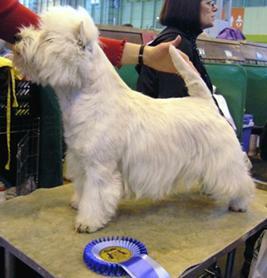 Representant from our kennel Ilém zo Zlatej Záhrady (s: Emir zo Zlatej Záhrady, d: Louisette White Oleander) took part at the world´s accomplished dog show Crufts 2009 5.-8. 3.2009 in Birmingham (UK). He achieved there great success. 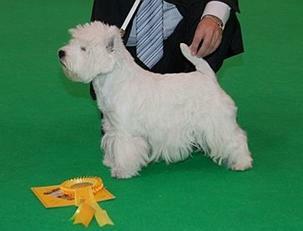 In his class in a big concurence of many westies achieved a great result, by winning the 2nd place. 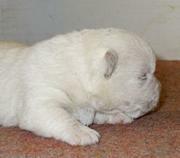 Congratulations to Ilém and his owner Mrs. Sofie Toender. 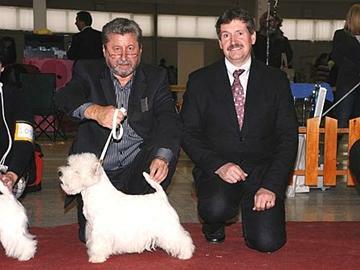 On 29.3.2009 took place the Club Dogshow in Viničné (SK) where Emir zo Zlatej Záhrady got great evaluation EXC1, CC, CAC, Club winner and finally BOB and BOG 2. 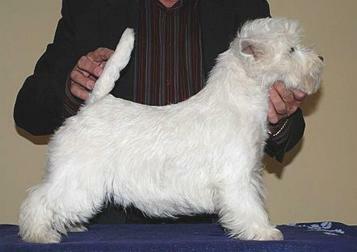 Emir zo Zlatej Záhrady crowned his present sucsess by getting the title TOP West Highland White Terrier 2008 and in the competition for TOP Terrier 2008 winning the 3rd place. At IHA Dogshow in austrian Wieselburg 4.4.2009 got Emir zo Zlatej Záhrady evaluation EXC3. At the annual CACIB dog show in hungarian Szilvásvárad, which took place on Sunday 12.4.2009, Emir zo Zlatej Zahrady made us happy again. The judge Ing. 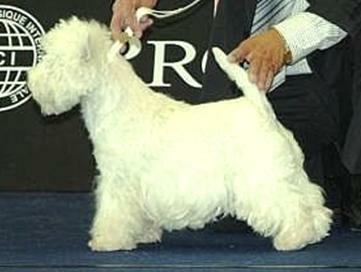 Jaroslav Kubaľa gave him evaluation EXC1, CAC and CACIB. Finally he confirmed his good condition and success by getting the evaluation BOB. 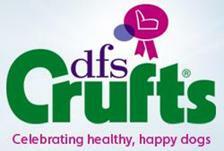 With these great results he fulfilled the conditions for becoming an InterCHampiOn and he also nominated himself at the biggest world dog show CRUFTS 2010 which takes place in english Birmingham. 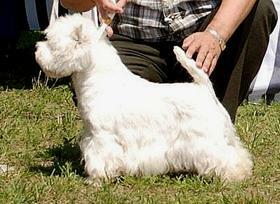 During the weekend 9-10.5.2009 was CACIB Dog Show in Bratislava (SK), where we´ve got these evaluations. 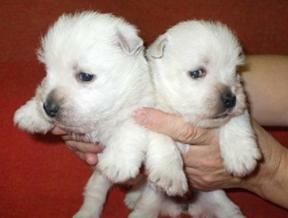 On saturday got Ch. Emir zo Zlatej Záhrady evaluation V3 and Jessy zo Zlatej Záhrady V2, RCAC. On sunday got Ch. Emir zo Zlatej Záhrady V2, RCAC, RCACIB and Jessy zo Zlatej Záhrady V1, CAC. At IHA Dog Show in Oberwarte (A) 18.7.2009 we´ve got these evaluations. Heidy zo Zlatej Záhrady EXC2, RCACA and Jessy zo Zlatej Záhrady same evaluation EXC2, RCACA. 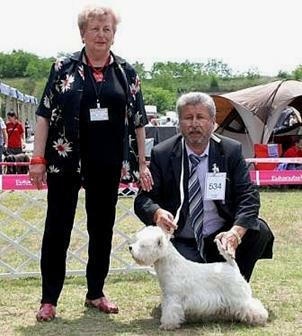 At the International dog show Grand Prix Slovakia in Nitra 6.6.2009 we got these evaluations Ch. 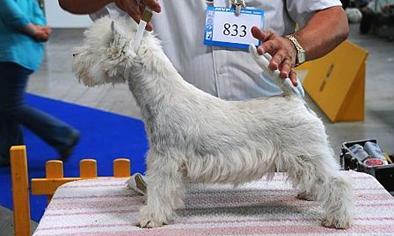 Emir zo Zlatej Záhrady in champion class EXC3 and Jessy zo Zlatej Záhrady EXC1, CAC, RCACIB. 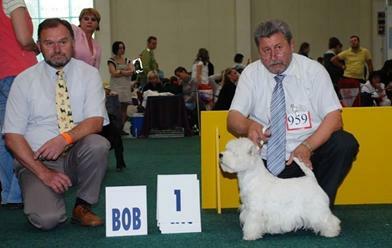 On 16th August 2009 we took part at the traditional show Duodanube Bratislava, where a new representant of our kennel, Noel zo Zlatej Zahrady, introduced himself on an international level. 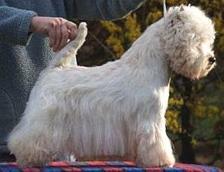 In his class he got very good evaluation as „very promising“. 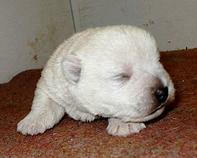 We believe he will be that successful also in the future. Also other our representants did not fail. 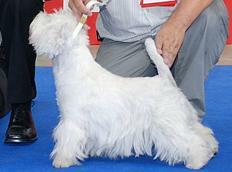 Jessy zo Zlatej Zahrady got evaluation EXC 1, CAC, CACIB and Heidy zo Zlatej Zahrady finished by getting EXC 2, RCAC. 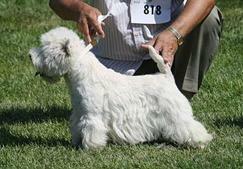 During the first weekend of October we took part at two dog shows with Jessy and Heidy. On Friday 2.10.2009 at CACIB Komárom (H) got Jessy zo Zlatej Záhrady EXC1, CAC and Heidy zo Zlatej Záhrady EXC2, RCAC. On Saturday 3.10.09 at IHA Dog Show in Tulln (A) got Heidy zo Zlatej Záhrady EXC1, CACA, CACIB and Jessy zo Zlatej Záhrady EXC1, CACA, RCACIB. 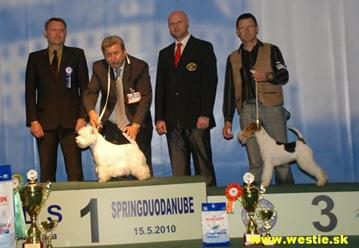 8th - 11th of October 2009 was exceptional for the slovak breeding society, because of shows INTERRA (Friday) and WORLD DOG SHOW (Thursday till Sunday) in Bratislava (SK). It was excpetional also for us, because our young Jessy zo Zlatej Záhrady which managed to get at the INTERRA show evaluation EXC1, CAC. 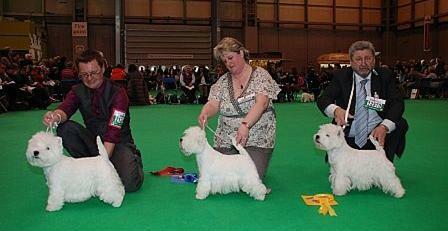 At the same show got Heidy zo Zlatej Záhrady evaluation EXC. 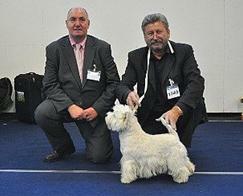 At WORLD DOG SHOW 2009 in Bratislava represented us very well Jessy zo Zlatej Záhrady, which got evaluation EXC1, CAC, CACIB and at the end a great title WORLD WINNER 2009. 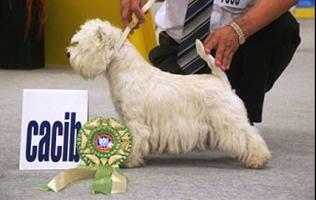 She also fulfilled the conditions for getting the title Slovak champion. 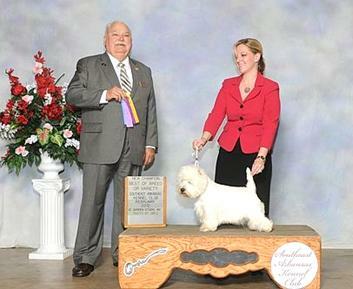 Our others dogs got at the WORLD DOG SHOW these evaluations. Dalma zo Zlatej Záhrady got EXC4 and Emir zo Zlatej Záhrady got EXC. 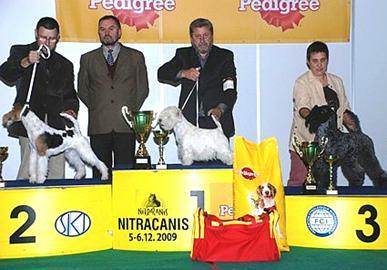 Next big success got our Jessy zo Zlatej Záhrady getting the evaluation EXC1, CAC, CACIB and finally got the title BOB and BOG at International Dog Show Nitracanis in Nitra (SK) 5.12.2009. 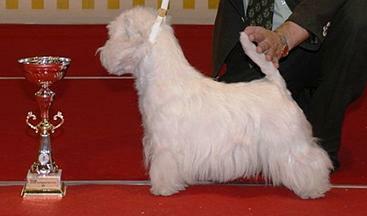 During the weekend 15-16.5.2010 in Bratislava there took place the traditional two-days dog show SPRINGDUODANUBE. Saturday the show was connected with nomination for the Crufts, where our Jessy zo Zlatej Záhrady got from a slovak judge Mr. Seman evaluation CAC, CACIB, BOB and finally from judge Mr. Skok from Croatia also BOG. On this show introduced himself also our new nurseling Rocky zo Zlatej Záhrady, who acquited himself very professional in the ring. 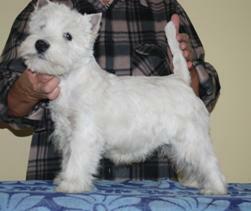 We believe that he will bring a lot of pleasure and success to his new owners, family Seko from Bratislava. Congratulations! Saturday the show had the attribute Central-East European. 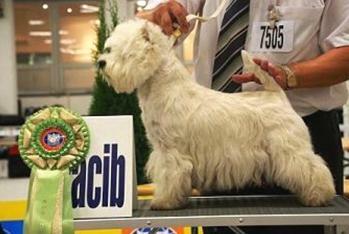 There Jessy zo Zlatej Záhrady got evaluation CAC, CACIB and Central-East European winner. 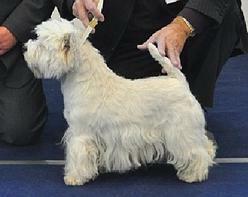 To our surprise, the westies were judged by the hungarian judge Mr. Kórózs, instead of Mrs. Molinari from Portugal. We do not comment his decisions, everyone can make an own opinion (photo 16.5.2010). During the weekend 22.–23.5.2010 with a very good cast up the International CACIB dog show took place in the hungarian Komarom. Here our Jessy zo Zlatej Zahrady got on the first day evaluation EXC1, CAC, RCACIB from the japaneese judge Mr. Fujihata and on the next day from Mr. Jovanović from Serbia she got evaluation EXC1, CAC, CACIB. 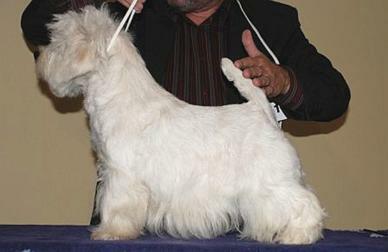 On 5.6.2010 we took part at Grand Prix Slovakia in Nitra (SK), where our Jessy zo Zlatej Záhrady got evalutaion EXC1, CAC, CACIB and finally got the title Grand Prix Slovakia winner 2010. 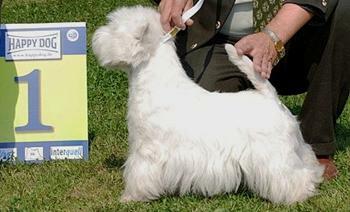 On Saturday 12th of June 2010 we took part at traditional IHA Dog Show in Klagenfurt (Austria). 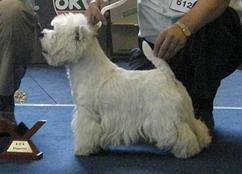 Our Jessy zo Zlatej Záhrady got again evaluation EXC1, CAC, CACIB, BOB and finally BOG 2. On the Special dog show in Košice 10.7.2010 introduced herself for the firs time our young and promising Odry zo Zlatej Záhrady, whichgot very good evaluation EXC1, CAJC. 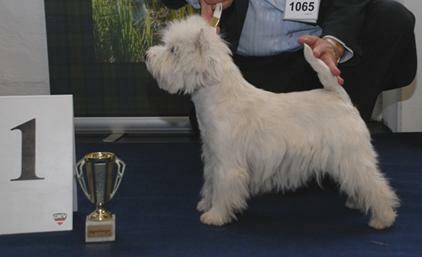 Jessy zo Zlatej Záhrady was again successful when she got in the champion class evauation EXC1, CAC and finally also evaluation “Winner of Special dog show”. 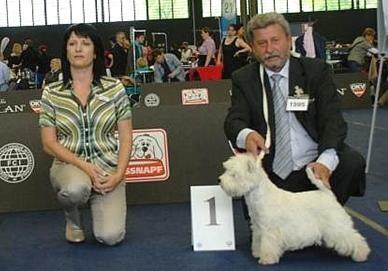 The International dog show in Brno 19.6.2010 was again a success for Jessy zo Zlatej Záhrady when she got EXC1, CAC, CACIB. 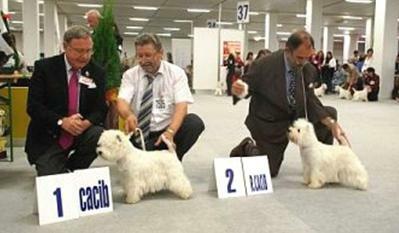 The International dog show in Bratislava was a successful performance of our Jessy zo Zlatej Záhrady, which during the both days 21. and 22.8.2010 got evaluation EXC1, CAC, CACIB. 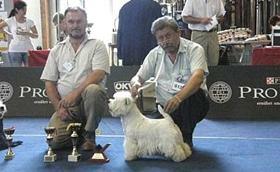 With the CACIB on Saturday 21.8.2010 she fulfilled the conditions for getting the tittle Inter Interchampion. 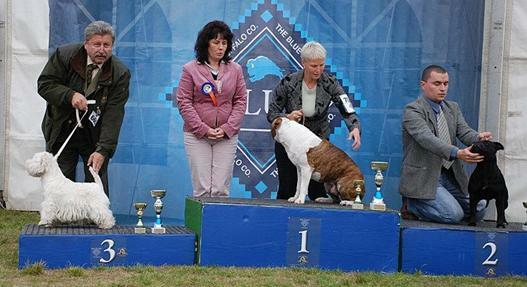 CACIB Dog Show in Komárom (HU) 16.10.2010 was very successful for our Jessy zo Zlatej Záhrady, which got evaluation EXC1, CAC, CACIB, BOB and fulfilled the conditions for getting the title “Hungaria Champion”. Finally she got evaluation BOG 3 too. 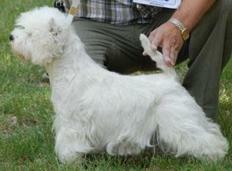 Our Heidy zo Zlatej Záhrady is over three very successful days at shows in Nitra. 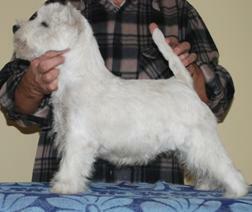 Friday 19.11.2010 she got evaluation EXC1, CC, CAC at terrier club show and got also the tittle “Club winner”. 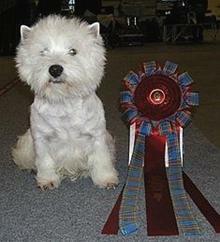 Saturday 20.11.2010 she took part at the show Nitracanis, whe she was evaluated with EXC1, CAC, RCACIB and Sunday 21.11.2010 she crowned her success by getting the evaluation EXC1, CAC, CACIB. 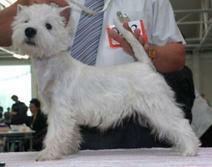 Fulfiled the conditions for getting the tittle “Slovak beauty champion”. We are very proud of the success of one of our legionars Noel zo Zlatej Záhrady, which excellently represents our kennel in the faraway Australia. 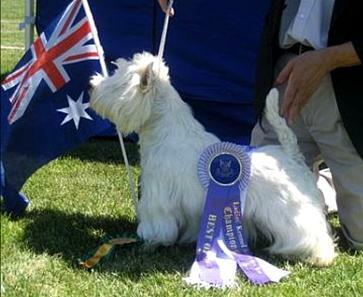 At the end of the year 2010 after the series of success at national shows he was titled Australian champion. 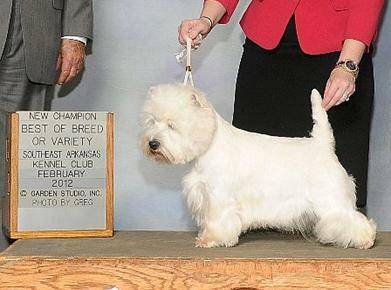 Congratulations to Noel and his owner Mr. Darryl Watts and we wish a lot of success in the future. 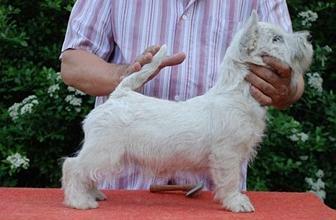 The great results of this year confirmed Jessy zo Zlatej Záhrady also at the international dog show IHA in the austrian Wels. Here she got on the day 4.12.2010 evaluation EXC1, CACA, CACIB, BOB and on the second day she was also very well evaluated with EXC1, CACA, CACIB. 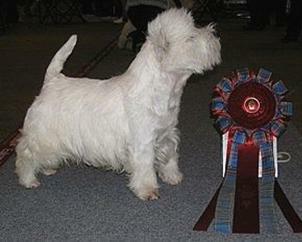 Fulfiled the conditions for getting the tittle “Austrian champion”. 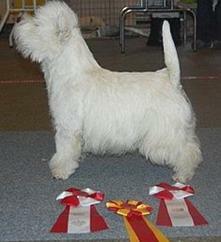 16.2.2011 was in Graz (Austria) IHA Dogshow, where took the part for a first time our promising Sunny zo Zlatej Záhrady. He got evaluation V3. 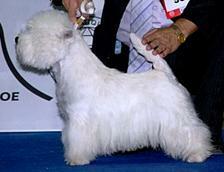 Masterful was again Jessy zo Zlatej Záhrady, which got evaluation EXC1, CAC, CACIB. 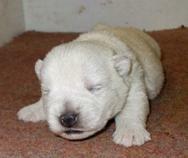 We are offering very perspective puppies for sale for breeding purposes. The 7 months old Yorik zo Zlatej Záhrady from mating of Dalma zo Záhrady & Rocky zo Zlatej Záhrady, puppies from a new litter after Dalma zo Zlatej Záhrady & White Diamant Oh´la la Choccollate and puppy from mating Heidy zo Zlatej Záhrady & Emir zo Zlatej Záhrady. 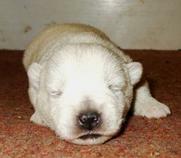 Here´s a new success of a young male from our kennel which is now living in the USA. 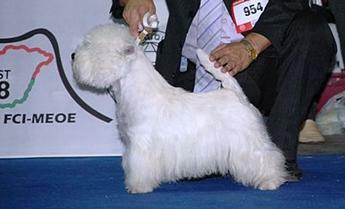 Uncas zo Zlatej Zahrady achieved the tittle AKC Champion in January 2012. 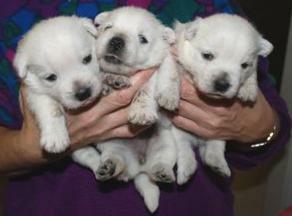 Congratulations to his owner Mrs. Frances Fielder. 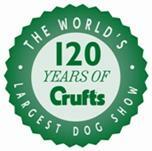 On Friday 18th May 2012 we took a part at the World dog show in Salzburg (Austria), where we achieved a great result with our ICH. 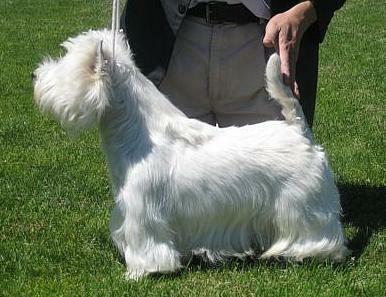 Jessy zo Zlatej Záhrady, which in champion class got evaluation CACA and afterwards R-CACIB. During the weekend we took part at two CACIB shows in hungarian Komárom, where on the both days our ICH. Jessy zo Zlatej Záhrady got in her class evaluation EXC1, CAC and afterwards CACIB. Also in the new season 2014/2015 we have or representants at shows, Chockie zo Zlatej Záhrady, Elka zo Zlatej Záhrady a Eimi zo Zlatej Záhrady. 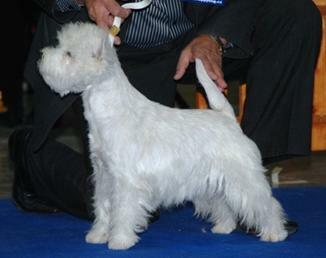 We are very proud of achieving the title Junior champion of Slovakia for Elka zo Zlatej Záhrady. 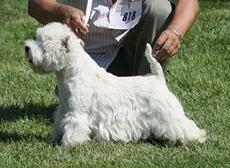 Have a look at the Evaluations and pedigrees, where you can find all the results.